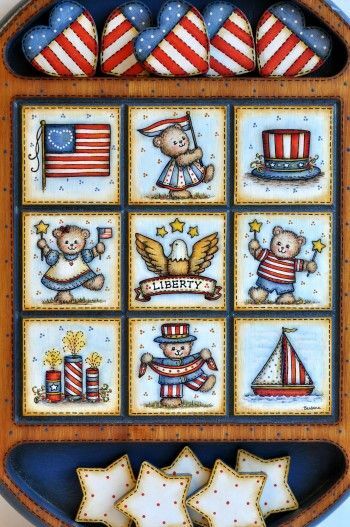 Featuring patriotic designs painted on a tic-tac-toe board measuring 7” x 10”. It has recessed areas at both ends for the hearts and stars. The center portion could be enlarged and painted on a larger surface. The individual designs can also be painted separately. I painted some of the little bears on little star boxes. This e-packet contains: Complete directions, two color photos and one full size pattern page for a total of 6 pages.